National Good Neighbor Day is September 28th this year. And here at Aprilaire, we’re using it as a chance to appreciate the communities we live and work in. We’re proud of our long-standing tradition of providing volunteer and financial support to non-profit charitable organizations. Additionally, our employees donate their time and resources each year to efforts they care about, all in support of making our world a better place. We continue to believe in being good neighbors throughout our local communities. One organization that Aprilaire is involved with is Sustain Dane, who is committed to sustainability in the Madison, Wisconsin area. We believe local efforts like theirs are a great way to initiate positive change on a worldwide scale. Most recently, we’re impressed by the dedicated efforts of The Ocean Cleanup Group to clean up the Great Pacific Garbage Patch. Located halfway between Hawaii and California, the Great Pacific Garbage Patch(GPGP) is the largest accumulation of ocean plastic in the world. Not only does all that plastic cause harm to marine life, but it also poses health and economic concerns for humans as well. The passive cleanup system they created will corral the plastic that floats on the top layers of the seas. As a show of support, we encourage Aprilaire employees to use reusable water bottles, coffee cups, and food containers to help stop the problem at the source. 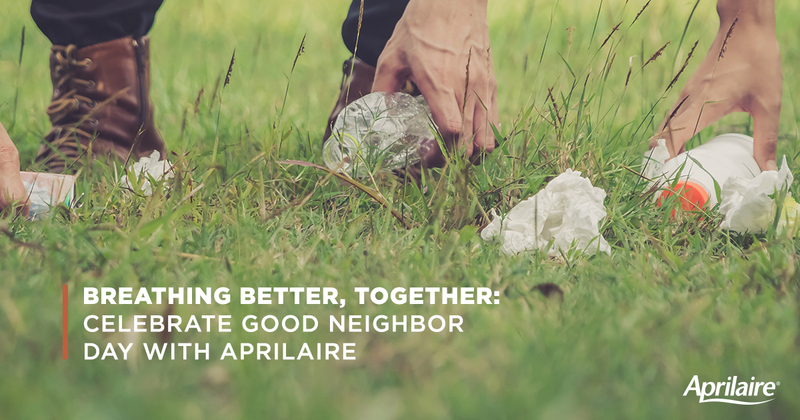 Another area that’s deeply connected to our mission at Aprilaire is the cleanup and recovery efforts for wildfires, particularly in the western United States. This year alone in California, over 1.4 million acres have burned and thousands of homes have been destroyed. The estimated cost of damages is over $2.5 billion. The first step is relief and recovery for the people displaced or otherwise affected by the wildfires. And that’s the goal of the California Community Foundation. Long-term, the prevalence of wildfires needs to be managed. There were over 6,ooo wildfires in California this year. All those fires create smoky conditions that are dangerous for the health of anyone living within range. Aprilaire believes that a good living environment starts with having clean, fresh air to breathe. And that’s true for inside your home and in the great outdoors. Next Next post: Teaching Kids About Healthy Air: Try this fun experiment to show kids what they’re breathing!